Wow. The past two weeks of my life have been rough. 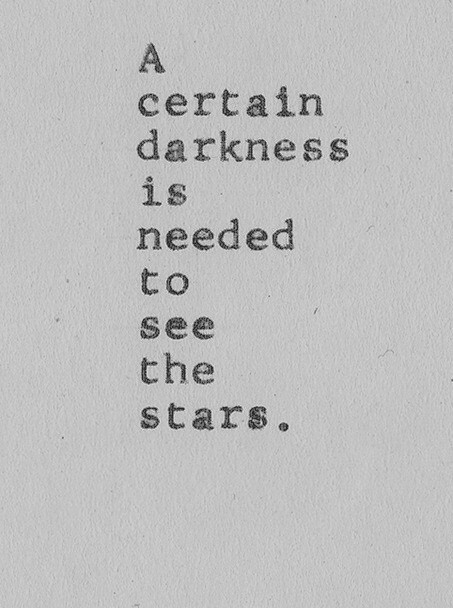 To put it this way, I’ve seen darkness in two different parts of my life…and…thankfully, both have ended with being able sift through the darkness to see the stars, which allow access to the light. I have no idea why things happen the way they do. I suppose the saying is right: sometimes you have to hit rock bottom in order to make a change. I’ve used the saying all throughout my journey from Couch Potato to CrossFitter, but I had no idea it would also apply to relationships with those you love: family, friends, etc. It was hard being in the darkness for even a day, but coming out of it makes you appreciate life and the people you love even more. You start fresh and renewed ready to commit more time and love to the relationship and the strength to tackle the next problem. I don’t believe you have to be bound by blood for a loved one to be family. I am thankful to have great friends who I consider family and I am also thankful to have a great family – both come together to support me and my goals. For all my family and friends, I love you all. I appreciate your care, concern and prayers. Please know not a day goes by that I do not think of you in some way: a memory, a song, a picture…you all live within my heart. It has been awhile since I have posted, but life has been hectic lately. I was sick last week. I suppose that rainy Color Run wasn’t the best for someone already feeling under the weather. And as you all know, I’m in school. So on top of working full-time, being a mother, wife and CrossFitter, I’m also a student. Life is hectic and busy. I will try my hardest to keep ichalkit updated, but please bear with me if I miss some days. To catch y’all up, I celebrated my 30 pounds lost with some very special people over the weekend. Needless to say, my workout on Monday was pretty rough due to all the “celebrating” on Saturday. Yesterday, we had a special tribute WOD to 9/11. Let me just mention that the WOD included 1,377 jump ropes. Wowza, right? I NEVER want to do that many jump ropes again. Well, I guess I can do them again next year. I can handle them once a year, I think.